This illustration by the Mughal court artist Khem Karan is an illustration from the Akbarnama (Book of Akbar). 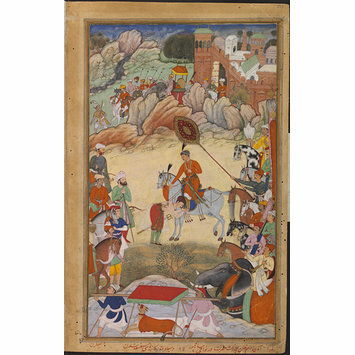 It depicts Adham Khan, who had been given charge of an expedition to conquer Malwa in north central India for his foster-brother, the Mughal emperor Akbar (r.1556–1605). Adham Khan is shown submissively paying homage to Akbar at Sarangpur in 1561, following his attempts to subvert the emperor’s authority. The Akbarnama was commissioned by Akbar as the official chronicle of his reign. It was written in Persian by his court historian and biographer, Abu’l Fazl, between 1590 and 1596, and the V&A’s partial copy of the manuscript is thought to have been illustrated between about 1592 and 1595. This is thought to be the earliest illustrated version of the text, and drew upon the expertise of some of the best royal artists of the time. Many of these are listed by Abu’l Fazl in the third volume of the text, the A’in-i Akbari, and some of these names appear in the V&A illustrations, written in red ink beneath the pictures, showing that this was a royal copy made for Akbar himself. After his death, the manuscript remained in the library of his son Jahangir, from whom it was inherited by Shah Jahan. The V&A purchased the manuscript in 1896 from Frances Clarke, the widow of Major General John Clarke, who bought it in India while serving as Commissioner of Oudh between 1858 and 1862. Painting, in opaque watercolour and gold on paper, Adham Khan paying homage to Akbar at Sarangpur, Central India, in 1560 or 1561. The Akbarnama was commissioned by the emperor Akbar as the official chronicle of his reign. It was written in Persian by Abu'l Fazl between 1590 and 1596 and is thought to have been illustrated between ca.1592 and 1594 by at least forty-nine different artists from Akbar's studio. After Akbar's death in 1605, the manuscript remained in the library of his son, Jahangir (r. 1605-1627) and later that of Shah Jahan (r. 1628-1658). The Museum purchased it in 1896 from Mrs Frances Clarke, the widow of Major General Clarke, who had been the Commissioner in Oudh province between 1858 and 1862. 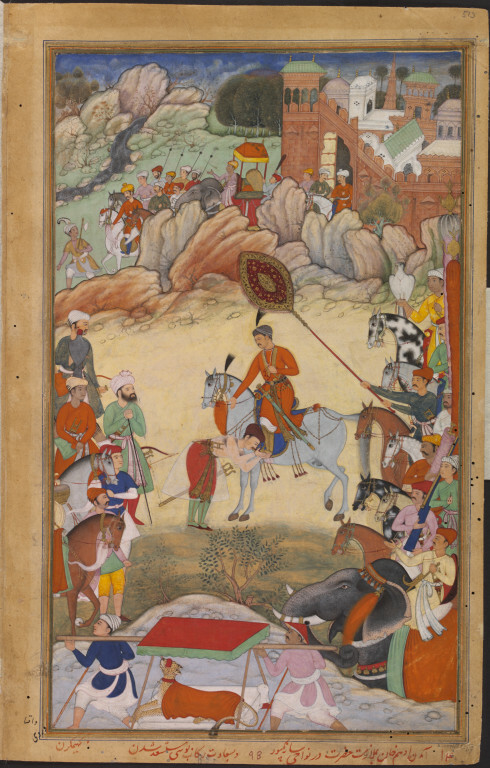 Historical significance: It is thought to be the first illustrated copy of the Akbarnama. It drew upon the expertise of some of the best royal painters of the time, many of whom receive special mention by Abu'l Fazl in the A'in-i-Akbari, the third book of the Akbarnama. The Persian inscriptions in red ink in the margin beneath the paintings name the artists.